Not all twentieth century buildings at risk are modernist tower blocks or Brutalist complexes. Sometimes unpretentious but noteworthy buildings can be at risk; even listed ones. 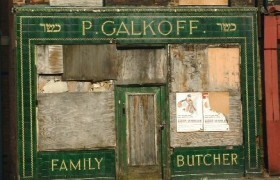 The former Jewish kosher butchers shop at 29, Pembroke Place, Liverpool is one such case. Although it was listed grade 2 in 2007 for its “nationally unique” shop front, the property is now looking increasingly derelict. It has been bought by the neighbouring Liverpool University School of Tropical Medicine. It is boarded up and saplings sprout from it. The shop front dates from about 1930. It has an almost complete green tiled frontage which includes the name of the butcher P Galkoff and the Hebrew symbol for kosher food. The interior of the shop dates back in parts to around 1820 (see History below) when Liverpool was becoming one of the world’s greatest emigration ports, not just for Britain and Ireland but also for northern Europe. Pembroke Place was the centre of the city’s Jewish community. The Galkoff family took over the shop in 1907 and they clearly made enough money to have the fine tiled front built in the early 1930s. They left the business in 1991. English Heritage described the shop as ‘an eloquent reflection of Jewish identity in Liverpool at this time’. It’s also a charming example of early twentieth century tile design. Our colleagues in the Tiles & Architectural Ceramics Society are concerned, as are local activists in Liverpool. Galkoff’s is a twentieth century listed building, at considerable risk, so we’re concerned too. It would be a huge shame if it were to be swept away. Galkoff`s was built around 1820, originally as a dwelling house then later as a hardware shop. It was then a furniture shop before becoming a kosher butcher’s in 1907. The property was originally situated in the middle of a Georgian terrace, consisting of five three storey houses (nos 25 to 33), which was built during the same period. Numbers 37 and 41 Pembroke Place are the two ends of Watkins Terrace, the last remaining court dwelling in the city. Number 29 became a kosher butchers in 1907 when Percy Galkoff purchased a 75 year lease on the property and transfered his first business from smaller premises in nearby 66 Brownlow Hill to the thriving and growing Jewish émigré community in the London Road area. 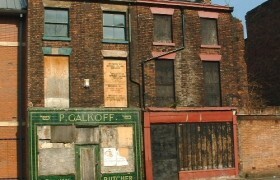 The property was leased by Percy Galkoff until it was sold to Liverpool City Council in 1979. The property changed hands; the present owners purchased 29 Pembroke Place in 1990 with the intention of refurbishing the property and bring the building back into use as a small business with living accommodation above the retail area. After being granted planning permission, negotiations began for the removal of a covenant restricting the property’s use to residential only. Building work began in 1991, but the London Road area became a regeneration initiative zone and discussions concerning the removal of the covenant passed to the London Road Development Agency. The matter was only resolved in 1995. Further delays, awaiting the consideration of other proposals for the terrace and many other problems, compounded by the demolition of 25 and 27 in 1994, contributed to the postponement of the property’s development. An apartment block now stands on the site of 25 and 27 Pembroke Place. Following the sudden demolition of 25 and 27, the restrictive covenant was removed. Planning permission was again granted in 1995 for 29 Pembroke Place as the previous planning approvals had lapsed waiting for the development agency to decide the fate of number 31. As restoration works on Galkoff`s were about to recommence in 1995, the LRDA gave notification of their proposed demolition of 31 Pembroke Place: that is Galkoff`s sole structural support since the demolition 25 and 27 Pembroke Place. This resulted in works stopping for a third occasion, until the proposed demolition of the building was resolved. The city council’s Property Services Department intervened and prevent the development agency from carrying out the demolition. In October 2003 new refurbishment proposals for 29 and 31 Pembroke Place had been offered but a planning assessment on the Daulby triangle site was later conducted delaying matters. In December 2004 the properties were inspected by Liverpool’s conservation officer and the remaining properties 29 to 41 Pembroke Place identified as Georgian, built around 1820.